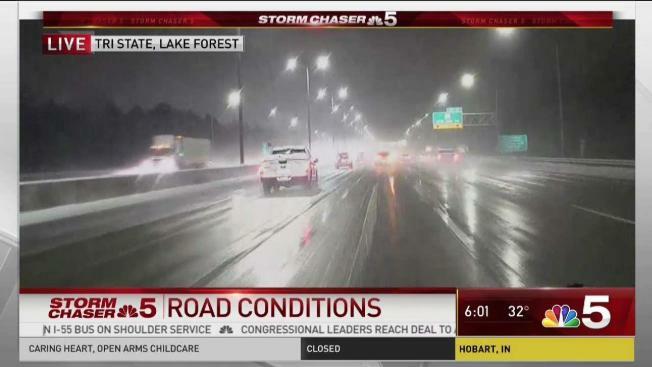 Lisa Chavarria reports from Storm Chaser 5 as icy conditions make for hazardous travel in the Chicago area. Numerous crashes were reported along with big delays and transit issues as an Ice Storm Warning continued for parts of the Chicago area Tuesday. The warning remained in effect until 9 a.m. for DeKalb, DuPage Kane, LaSalle, Cook, Grundy, Will and Kendall counties in Illinois along with Lake County in Indiana. South Shore Line and Metra Electric trains were suspended Tuesday morning due to "extreme weather conditions." Meanwhile, other Metra lines were experiencing delays due to switching problems. The Chicago Transit Authority also said some lines were operating with "major delays" due mechnical problems from severe weather, particularly Green Line and Pink Line trains. Still, CTA said it will honor Metra tickets on the following bus routes: 71, 26, 28, 6, J14, 2 and 1. Riders were also encouraged to take Rock Island District trains or Red Line trains if possible. Motorists were being urged to leave extra time as numerous spinouts and slick spots continued through the morning rush hour, according to officials. "We’re just asking people to give extra time, keep it slow," said Illinois Department of Transportation spokesman Guy Tridgell.